Benefits: Sri Yantra is a Three-Dimensional Shree Yantra, the embodiment of Sri Lakshmi and Tripura Sundari. We are a well-renowned organization in the industry to provide our patrons the best quality array of Shree Yantra 3D. 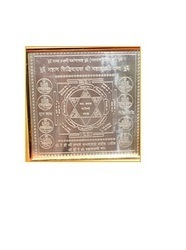 Keeping in mind the precise demands of clients, we offer a wide range of Crystal Shri Yantra. These are exclusively designed as per latest market trend. Owing to its optimum quality and excellent transparency, these yantras are widely recommended by clients. Our shri yantras ensure high effectiveness. 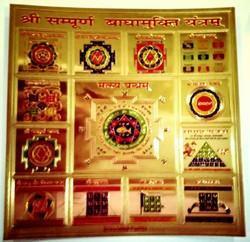 shri meru yantra is highly vibrative yantra , which helps cleansing the negative energies and promotes health n wealth. Shri Shubh Dhan Varsha is the original and sacred yantra which helps you to bring prosperity, wealth and happiness in your life. Each and every amulet of Goddess Laxmi is sanctified by the holy saints who have spent years in meditation. This yantra also have a 'Gold Plated Meru Shriyantra' & 'Gold Plated Shri Laxmi Charan' which brings perpetual growth & financial well being. Shree Yantra is one in every of the foremost auspicious, necessary and powerful Yantras, that not solely provides the most profit, however additionally proves useful for almost everyone. It is the supply of accomplishing all worldly wishes & fulfilling all desires through inner cosmic power & mental strength. There is a need for environmental energy cleaning and enhance positive energies. It is also required to create or replace missing natural positive energies. The source of these positive energies is from cosmos. Bring prosperity in your and your loved ones's life by bringing home this beautiful hand crafted marble shree yantra. The other important aspect of Indian Astrology is that it is very individualistic in nature. It highlights the specific predictions for each individual with an understanding that no two individuals will be the same.